Genießen Sie schöne Sonnenaufgänge von der Veranda mit Blick auf den ruhigen See. 3Br, 2 Bäder, LR, kann bis zu 7 schlafen. Glas / gescreent geschlossene Veranda mit Tisch für entspannende Abendessen im Sonnenuntergang. Wenn Angeln Ihre Leidenschaft ist man dem Himmel gefunden. Voll ausgestattete See mit Hecht, Bass, Barsch und Wels. Entspannen Sie am See durch das Feuer in der Feuerstelle und die Sterne beobachten. Nutzen Sie Kanu oder Kajak und paddeln Sie in der Abenddämmerung für eine beruhigende Erfahrung. WiFi für diejenigen, die verbunden werden müssen. Grill, Mikrowelle, Ruderboot, Kanu und Dock. Voll ausstatten. Kit., Bettwäsche und Handtücher Bring dein eigenes mit. Müll muss zu Beginn der Augur-Seestraße zur Übergabestelle gebracht werden. Es gibt eine Schutzgebühr pro Beutel. Der Bahnhof ist dienstags und freitags und samstags geöffnet. Family of 4 had a great time here. Tom was easy to work with and he called to give us more personal information about the house and activities, which we appreciated. By far the best was the lake access and to take advantage of paddling and swimming in the lake- We were also there during a particular hot week, but the house has ample fans that helped keep it cool in the evenings. We did find the wi-fi helpful, but note the connection is not strong enough for streaming videos or uploading pictures- so plan to truly disconnect while you are here! Even though we had cooler weather we still loved our stay! Tom Kramer was wonderful and we loved the amenities! Waking up and kayaking at 6:00am, watching the sunrise was amazing! Swimming off “The Rock”, and fishing for sunnies, it was great for all ages! Definitely would consider visiting again!! I went up with my girl, my 3 daughters, 2 dogs, my dad his wife and kids. The house is tucked away in the woods right off the lake. No matter what anyone wanted to do it was able to be done here. There is amazing fishing, kayaking, hiking, boating, swimming. Totally quiet and a great place to forget that big cities and cell phones exist. A wonderful house right on the water, but convenient to a lot of great things to do in the area. Absolutely loved our stay here! 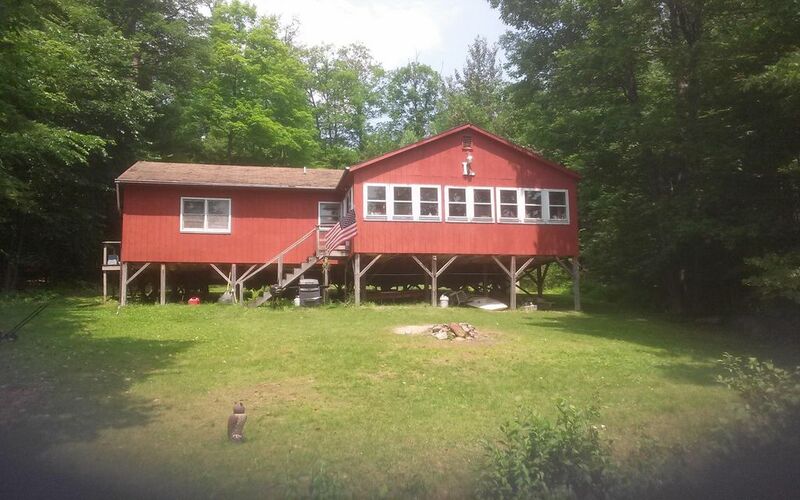 The Kramer family lakehouse is super equipped with all your cooking-grilling needs----super large house with plenty of room with screened in porch---2 bathrooms-2 kitchens-4 bedrooms with ceiling fans, not to mention the canoe, rowboats, kayak and dock!! Brought our 2 dogs whom were right at home in the house and on the property---excellent smallmouth bass fishing, perch, sunnies-all caught on worms. Nice and peaceful---tranquil lake --beautiful little island to row out to fish-swim....Thank you Kramer family for sharing your beautiful lakehouse---what a true gem!!!! This property is very rustic, much more than I am used to staying in. It is very spacious and fully equipped. There was plenty of space for everyone including for a large family sit down dinner. There is alot of algae at the edge of the lake but you can rake it up easily and it will stay clean for a couple of hours. Once you get past that, the lake is really nice. There is a rocky area in the middle of the lake which was fun to kayak out to and fun to swim around. There are alot of memories around the cabin from the family that used to reside here and that was really cool. We made a campfire one night and that was fun. The owner is very responsive and available. Check-in 4PM Check-out 10AM Renters are expected to clean before leaving so that the next renter can arrive. If the house has not been cleaned part or all of the security deposit will no be returned.